Originally posted at The Conversation. View original post here. With that in mind it is worth taking another look at what’s been happening in the electricity sector. For example, take a look at summer afternoon consumption of electricity dispatched on the National Electricity Market (the NEM is the electricity market that serves the east coast states and South Australia). Compared to the previous summer, afternoon consumption during the summer of 2014 fell a further 600 megawatts or 2.3%, continuing a downward trend that dates back to at least 2010. NEM average consumption for the summer season (months December through February) for the afternoon period of 1-5 pm EST. Data source AEMO half hourly aggregated price and demand data.. Note that in this analysis Tasmania has been excluded, because it joined the NEM late, in 2005. Image by Mike Sandiford. As has been widely commented, the change in outlook for the electricity sector over the last five years has been as dramatic as it was unexpected. Back in 2009, summer afternoon consumption was expected to rise at about 2.7% each year, as it had over the previous decade. 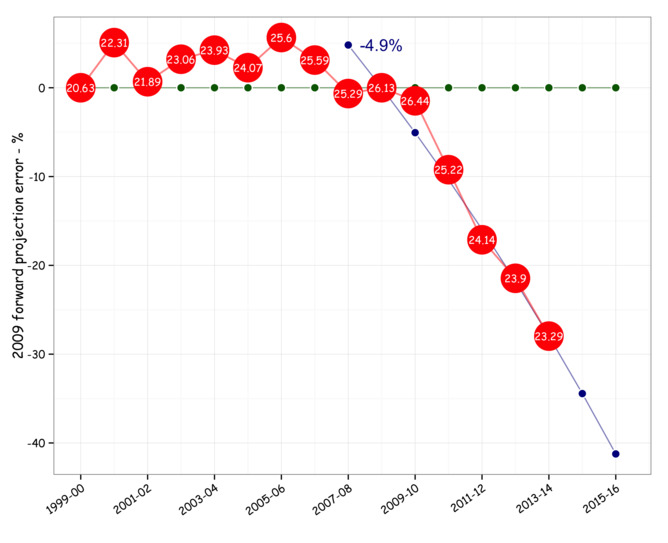 Compounded, the deficit on the 2009 forward estimates now stands at almost 30%. 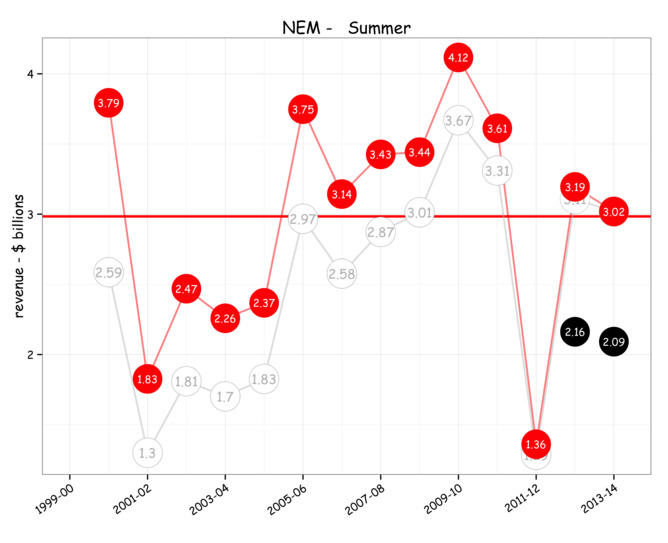 NEM average summer demand for the afternoon period 1-5 pm EST, relative to the projection of the 2000-2009 trend. Data source AEMO half hourly aggregated price and demand data. Image by Mike Sandiford. Summer afternoons are important, as that is traditionally the most profitable part of the year. So the afternoon decline in consumption is hurting the bottom line. The wholesale market operated by AEMO trades about $10 billion annually in 2014 dollar terms, of which about $3 billion belongs to the three months of summer. Notwithstanding that most participants are heavily contracted, the value of the wholesale market gives an indication of the underlying health of the sector. After factoring out the carbon tax contribution, the value of the wholesale market across the summer of 2014 was a touch over $2 billion. Across the last three summers the value, less carbon tax, was just $5.6 billion or a just a touch above 60% of the long-term average expected return. Traded value of electricity on the NEM across the summer season. Red circles show values expressed in 2014 dollar terms. Black circles, show adjusted values with carbon tax contribution removed. Image by Mike Sandiford, data from AEMO half hourly aggregated price and demand datasets. Because of the structure of the market, summer afternoons are when the traded values peak. Typically more the 50% of the summer revenue comes between the hours of 1-5 pm EST, when the spot price occasionally goes as high as the market cap ($13,100 for one megawatt hour of electricity) more than 200 times the average price. Over the last few years the value of this afternoon period has collapsed, especially in NSW, reflecting the growing oversupply in the market. In NSW, where there has been a dramatic reduction in volatility in spot prices, summer afternoon prices barely distinguishable from other times of day or year. 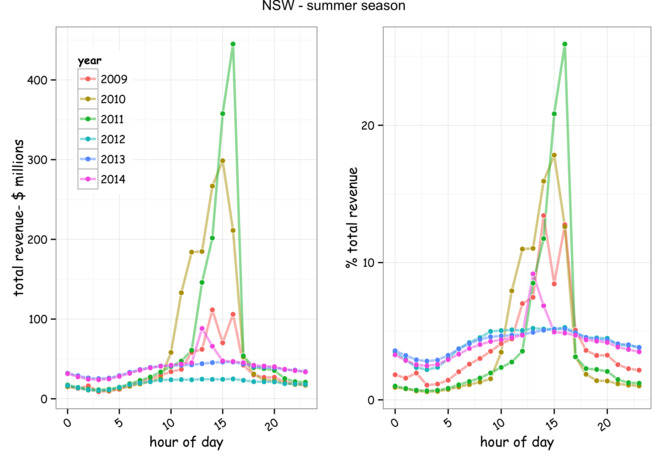 NEM traded values for the summer season for the New South Wales, as a function of hour of day. In 2010 and 2011, more than half the value was traded in the four hour afternoon block between 1 and 5 pm (times in EST). Over the last three summers, the NSW wholesale market value across this key afternoon period has been only marginally above other times of day. Image by Mike Sandiford, data from AEMO half hourly aggregated price and demand datasets. One driver behind the dramatic collapse in daytime consumption, and consequent lowering of spot prices, relates to technology. This is made clear by looking at how consumption for the “poles & wires” electricity dispatched on the NEM has changed across the time of day, as in the figure below. The diagnostic parabolic decline in consumption centred on midday, especially in states with high solar PV takeup such as Queensland and South Australia, signal the important role of distributed electricity production by household solar PV in displacing demand for electricity dispatched on the NEM. 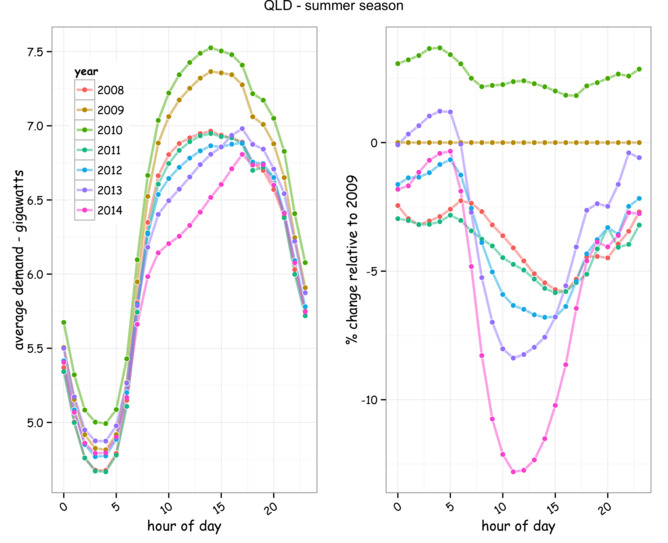 NEM average energy consumption rate by hour of day (EST) for the summer season in Queensland. The left panel shows the average consumption rate expressed in gigawatts for each of the years 2009 through 2014. The right panel shows the changes in demand relative to the summer of 2009, expressed as a percentage. Image by Mike Sandiford, data from AEMO half hourly aggregated price and demand datasets. As described above, the continuing reduction in summer daytime demand is manifestly cutting the lunch of the big generators, eating into their most profitable trading periods. Unsurprisingly, we are now seeing significant push-back by the energy utilities in an attempt to restrict further take up of the new distributed technologies, and the incentives that have motivated their take up. While that’s hardly a surprising reaction from an incumbent, what is surprising is how long its taken for the industry push-back. Now some five years into the decline and the question is, is it too late? In its crudest form, the electricity business model has been focussed above all else on selling more electrons. But after yet another summer on the NEM, it is clear that customers are not buying it. And looking at the trends, you’d have to be crazy to think the decline will stop. Not only is demand for “poles & wires” electiricty declining because of the new technological drivers, but big energy users are also exiting the market, making for a perfect storm. The recent announcement that the Point Henry aluminium smelter will close, effectively commits a further reduction in 350 megawatts – representing about 1.5% of NEM consumption (~7% of Victoria). With domestic, commercial and industrial users all significantly reducing consumption, the challenges in cost-effective delivery of “poles & wires” services is becoming paramount. While it’s increasingly evident that the business model of selling more electrons no longer washes, there remains considerable uncertainty in managing our demand at peak. Victoria went close to setting a record for peak demand in the heat wave this summer at 10.3 gigawatts. While that made a lot of news, with the possibility of load-shedding mooted by AEMO, that was a long way short of the pre-2009 trend expectation of a peak of around 12 gigawatts for the sort of heatwave conditions we experienced. 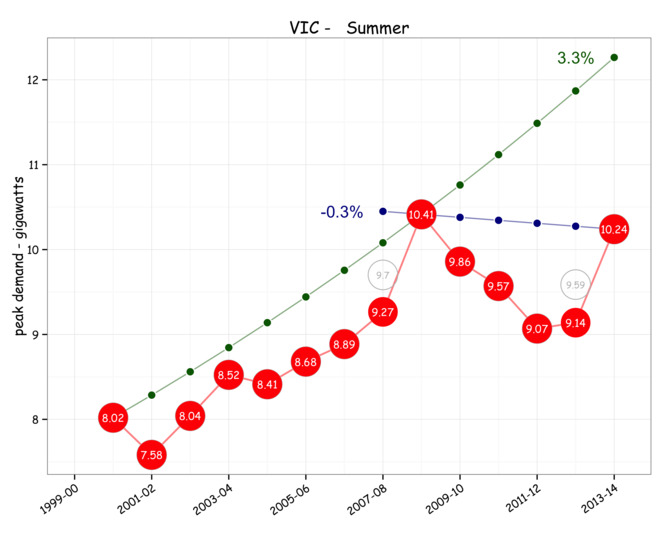 Peak demand for the summer season (December, January, February) in Victoria. Note that in some years such as 2013 peak demand occurred outside the summer season, as indicated by the grey circles. Because of seasonal weather variability, peak demand is much more variable than average demand – or consumption. Nevertheless, forecasts based on the pre-2009 trend suggested peak demand growth at above 3% per annum, giving an expectation of a peak demand of around 12 gigawatts in Victoria’s last summer heatwave. In fact the peak demand was around 10.3 gigawatts slightly lower than the peak demand record of 10.4 gigawatts in January, 2009. Image by Mike Sandiford, data from AEMO half hourly aggregated price and demand datasets. Nevertheless, the challenge of maintaining capacity to serve peak loads, while consumption continues to fall makes for an uncomfortable outlook for the industry. It necessarily leads to rising cost pressures for “poles & wires” electricity. And that will undoubtedly further incentivise take-up of the new distributed solutions made possible by the new technologies, such as solar PV. Thinking a Kodak-like death spiral yet? As an essential service, a death-spiral seems implausible. However, there is clearly a need to move on from the old game of simply selling more electrons. There is now a need to focus on delivery of quality energy services with less capital expenditure. 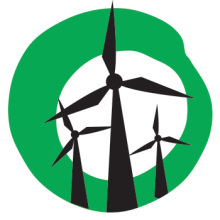 This necessarily means accommodating the new technologies of distributed generation and demand management, with a sharp focus on mitigating peak demand growth. There is the perception in the electricity game that demand is somehow inviolable. The last few years have shown that the claim that demand is essentially inelastic is demonstrably false. 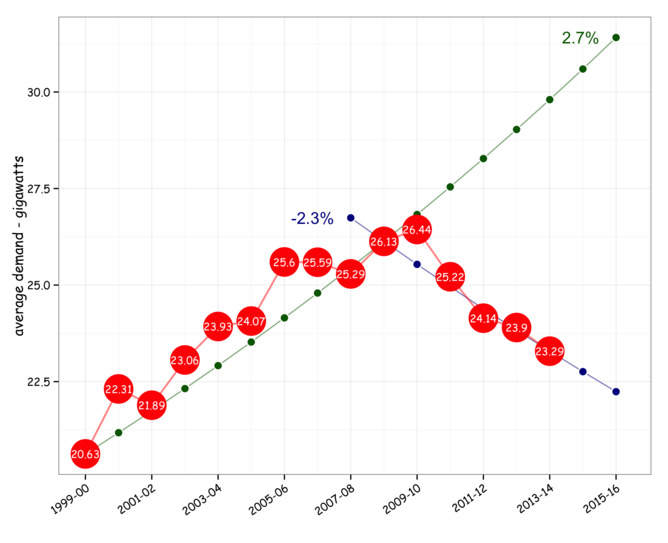 As retail prices have risen at double digit rates, consumption has collapsed. And the idea that loads can’t be shifted is a furphy. For years we have been massaging demand to fit our generation, for example by subsidising big industrial energy consumers or incentivising domestic users with off-peak tariffs, to infill low demand periods. When the challenge was to maximise efficiency of the base-load generators, such as in the Latrobe Valley, this may have been sensible. But as the challenge shifts to reducing the cost of distribution, centralised generation is no longer the only game in town. Not surprisingly, following another summer of declining demand on the NEM the industry response has given little hope of their embracing the rapidly changing technological landscape.